My main goal is to build a portfolio of $1,000,000 in 1500 days, starting from 1/1/2013. Every month, I provide an update on my status. 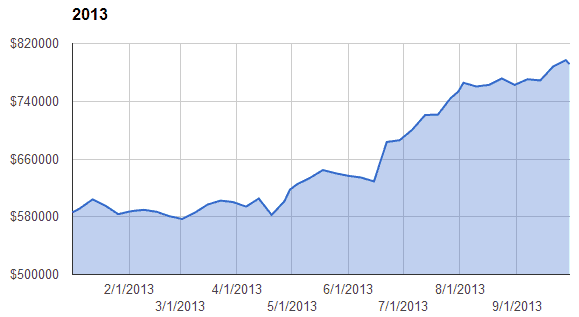 My goal for 2013 was to get my portfolio up to $672,750, from a starting point of $586,043. I accomplished this in June and then raised my goal to $727,750 to account for the money I made selling our last home that I plowed back into the portfolio. Time to look back on the month of September. September was another good month, for the markets and me alike. 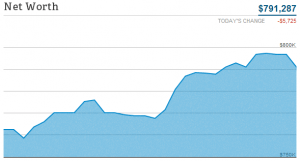 The S&P 500 increased from 1635 to 1681 for a gain of 2.8%. My portfolio went from $762,667 all the way up to $791,287 for a gain of 3.8%. Even better, the non-cash assets of my portfolio increased by almost $40,000 for a gain of 5.3%. I had to take $10,000 out of my cash stash to pay for home improvements, hence the 3.8% number. In any case, put an ‘X’ in the 1500 win column for this month. One other thing is that I’ve made my 2014 goal as well. I originally published the chart you see below in my first post*. Wooo! Left to go (2013): Goal accomplished! Facebook is the primary reason for my September gains. Facebook started the month at $42 and closed the month at $50. I own 2000 shares that I purchased at an average price of $29. Now I’ve said it before and I’ll say it again, I don’t advocate buying stocks. It is something I very rarely do. However, every once in a great while, I see something that others don’t and I can’t help myself. This is especially true with facebook. My thinking behind this purchase is a post in itself, so I’ll save that for another day. As far as investment advice goes, I must defer to MMM and Jim Collins excellent series. These fellas both know their stuff! My savings have dropped off to nothing lately**. Uglyhouse is like a giant vacuum, sucking money from our savings. I knew this going into the deal though. We bought our home in foreclosure for $45,000 less than it sold for 10 years ago. Based on the comps, I’m sure we got a good deal. I’m also doing as much of the work as I can myself, so I’m saving a bundle. The cash hemorrhage is also temporary. Soon, things will be back to normal and the only home expense I have will be a small mortgage payment and an incredibly low, $1,100/year property tax bill. I also enjoy the home improvement work. There is nothing like the sense of gratification when you step back and look at a bath or kitchen remodel. I just wish that I knew how to do more. I can build a spectacular kitchen (you’ll see it soon! ), but I’d really like to put a small second story on this home. Any carpenters out there want a paid trip to Colorado to have some fun swinging a hammer with me for a couple months? Not kidding here folks. I’ve been trying to find good help for 4 months with almost zero success. The buffoons in Washington are throwing their wooden shoes in the gears for a while and mucking things up. The government will also start to taper the bond buying program. Is it priced into the markets already though? Dunno. The market has had an incredible run this year. Nothing goes on forever. However, I”m still positive. If I had to guess, I’d say that the S&P 500 will end the year higher than it’s at now. Hmmm, this sounds like the makings of a good contest. Tune in Monday for more information on that. *I also mentioned in that first post that I need to be debt free before retiring. I currently have about $130,000 in mortgage debt, so I still need 330K before I can retire. **While the work on this house needs to be done and I knew it when we bought it, it still kills me to throw all this money at the project. I’ll be very happy when the work is done and we can move back into super saving mode. I’ve been waiting for this update as I’ve been watching your weekly updates in the sidebar. Those returns on individual stocks like FB almost makes me reconsider my approach of investing in only low-cost index funds. Almost. Also great that you already have met your 2014 goal. We’ll see what the future brings, but at this rate, you’ll need to rename the blog 800days.com. Wise words Buck. There are very specific reasons that I bought this one and I can’t wait to post about it. That is for another day though. Again, I don’t recommend anyone buying stocks. have you tried reaching out to Mr. Money Mustache? His blog is interesting and he does a lot of contractor work. I hear you on the cash hemmoraging. When we did our house and then the duplex it was like standing still in terms of after tax saving and investments while we got that work done. Nice work on the portfolio front! I can understand how it feels like the house is being a money hog right now, but I am sure all your hard work will pay off in the end. When my dad gutted our bathrooms in our old house and redesigned them, it was really neat to see the progress and it was definitely something to be proud of. In fact, as odd as it is to miss a bathroom, it was the one thing I was sad to leave behind. I can’t imagine having that feeling for your whole house! Thanks EM! Having the whole house done will be one hell of a feeling, but that is long, long way off. End of 2014?!? I think it’s great you know how to do those jobs. It’s saving you a lot of money! Yeah, it’s a lot of fun and once you do it once, you can repeat over and over. However, you may not want to tell friends and family that you have these awesome skills! Amazing work Mr. & Mrs. 1500!! I wish I had the stomach for individual stocks, but I just don’t. Our problem is that we have too much money in cash; we’re trying to rectify that with automatic weekly contributions to Vanguard Total Stock Market index fund, but it’s a slow process. This might not be the smartest route, but it’s one we can live with psychologically. Sounds like another excellent market. Each and every month I’ve been surprised by the market gains. It’s a great run we’re on, but it has to slow down or stop at some point soon. It’s incredible the progress you’ve made just in less than one year. At this pace, you’ll get to your goal even sooner than expected. Yeah, I can’t believe the numbers myself. I just keep waiting for a shoe to drop. I know I’ve read a lot of people predicting that the stock market is poised for a correction. One of the senior analysts at Wells Fargo basically got up on a table and started throwing a temper-tantrum about it a few weeks back (ok, not literally, but as financial cable-shows go it was dramatic). As someone with a portfolio of about 1/8th yours, I get concerned when P/E ratios for the entire market climb as high as they have. It makes me pine for the good ole’ days of 2008 & 2009 when everything was a great deal. One quick question, since you are advertising your win on FB. How would you say your total return on individual stocks has fared over your lifetime? Also, have you ever computed the risk-adjusted return? Yep, P/Es are above average, but not crazy high: http://www.multpl.com/ When they get close to 25, I’ll start worrying. I think my individual stocks have done very well. Best is Google which I bought at IPO for 85 and is now knocking on the 900 door again. I bought most of my Apple share in 2007 around $90. Amazon, Chipotle, Tesla and Solar City all continue to do well also. My biggest mistakes were selling. That is for another post! Congrats on meeting the end year goal so early. It’ll be interesting to see how the markets far in the next 3 months. If today is any indication, they clearly priced in the shutdown and plan on just keep moving along. I wonder if the debt ceiling will be any different. Of course, one would hope our leaders might get their heads on straight after dropping the ball on the shutdown. Micro recently posted…A tribute to the days of old: How to homebrew mead. I’d never count on our fearless leaders getting their heads on straight! They are a bunch of goofballs. The country needs to vote all of em’ out and start over! Great progress for you again this month. I was able to drop my debt by just over $1,000 in September and that is a big accomplishment for me. When I read your renovation posts I am reminded of the very funny Tom Hanks movie The Money Pit about renovating the house from hell. All of the homes I have owned are money pits in one way or another. Thanks Jane and congratulations on the $1,000. Oh wow, I remember the Money Pit. How true. Things usually ending costing more than you expect them to. Bah. I’m living it now. Congrats on meeting your goal 3 months early! Sure the market may not do quite as well next year, but maybe it will? I share your views on reinvesting in individual stocks, but I’m still interested in trying it out. Have any new stocks in your sight? I have no stock purchases planned and I’m actually not sure I’ll ever purchase another, except for Berkshire Hathaway which I make an exception for. I do like the Lending Club business and they will probably go public next year. Not so excited about Twitter though. Great job on the progress! I am not much of an investor but this is definitely an inspiration to try a few fun stocks like you have. I’m also with you on cash hemorrhaging. After getting married, it seems like we’re still not totally in control of all of our spending. I hope after this month of traveling we can get it under control. Be careful with stocks! Like I said in the post, I don’t recommend it. Often, I’ll think about a stock for a year or so before I take the plunge. Oh, there will be plenty more house pictures. I’m finishing up a deck now. Stay tuned. Great progress, Mr. 1500! I wouldn’t worry too much about the temporary housing expenses. That’s just a temporary turning point. It’ll be great to have that behind you, though! The market will end higher this year. Government shut downs are actually good for stocks at it forces them to confront certain issues. I predict next year stocks will be 10-15% higher than they are today. Awesome on Facebook. My Roth is doing well because I bought Netflix last year. Netflix has been on a rampage, good for you! Hopefully, they just don’t kick the can down the road. Maybe this time, they’ll make real progress? I’m skeptical, but both sides are standing their ground now. I like this blog for the outrageous writing style, like how you ream your own family so fantastically. But I am deeply wary that you take the tech-stock game so seriously: Facebook, Google, and Apple. It doesn’t seem wise at all to bank on these wildly popular stocks, as it is pretty sketchy to think of reasons they would rise consistently. Looks like the best you can do is buy high, sell higher and not wait for Tech Bubble 2, Electric Bugaloo. Apple had a couple big profit years, but to hold Apple is to bank on continued sales after its “technology” has already trickled “down”. Why do they have hundreds of billions in t-bonds, they don’t need your money. And how the heck does FB even make money? Those stocks make up a small portion of my portfolio. I bought Google at $85 at IPO time and can think of no reason to get rid of it at the moment. I bought most of my Apple shares for around $90 when the iPhone was announced. I thought it would be a hit and it was. With that said, the long term prospects of Apple are very shakey, so I’m slowly winding down my shares as I find other investments to put the money into. Facebook makes huge piles of money from their advertising. Consider that more time is spent on facebook than any other website. Now, consider the information that facebook has on it’s users. That combination is incredibly valuable to advertisers. They have hardly scratched the surface. I’ll soon have a post on facebook. Stay tuned.